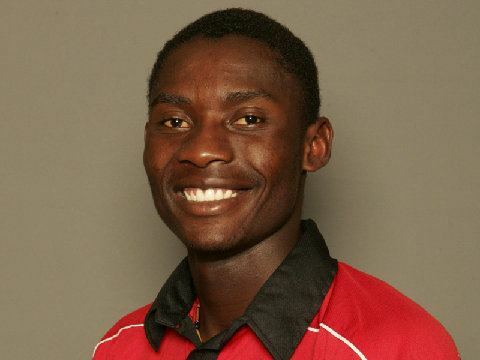 Christopher Bobby "Chris" Mpofu (born 27 November 1985) is a Zimbabwean cricketer. He has represented Zimbabwe at Test, ODI and Twenty20 International level. A tall seam bowler, he hits the pitch hard and can get good away movement - but as with many young quick bowlers consistency is his major problem. Technically, he has a good action but a better brace of his front leg through his delivery stride would allow him to make the most of his height, rather than collapsing as he tends to do at the moment. Mpofu made his first-class debut for Matabeleland against Manicaland in March 2004, taking three wickets on debut. In the 2004/05 Faithwear Inter-Clothing Provincial One-Day Competition, Mpofu was the leading wicket-taker with 11 wickets. He repeated the performance with again in the 2005/06 edition with 9 wickets. Following the mass exodus of top level players in the Zimbabwean cricket crisis of 2004, Mpofu made his One-Day International debut against England, and cost the English team some anxious moments. Following the exodus of the rebels, Mpofu was given his Test debut against Bangladesh at the Ma Aziz Stadium, Chittagong. He had scores of 0 and 5 in the match. The match was an indication of Zimbabwes horrific decline in Tests as Bangladesh secured their maiden Test victory that too by a major 226 runs. Enamul Haque jr. trapped Mpofu lbw to secure the win. One definite shortcoming, is his crease occupation. Not content with being stumped twice in an afternoon (for a pair) in the first Test against New Zealand in August 2005, he followed up by being run out for 3 in the second match, as he strolled down the pitch to congratulate his team-mate Blessing Mahwire on reaching his half-century, with the ball still in action. He still tends to blow hot and cold and has few rivals in the race to be considered international crickets worst batsman.